Bill Ward Original Conti Crayon Art. 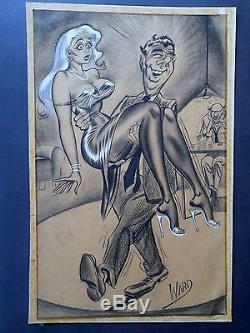 Piece measures 21 x 13 and appeared in Joker - March 1967 and Gee Whiz - November 1959. Piece is in perfect condition. 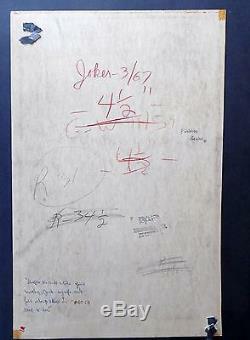 There are several written notations by Bill Ward on the back. Once says "printed 1959" and is signed by Bill. The other is a 2nd caption that was not used in the magazine. The magazine caption reads I'm sorry your wife and I can't stay to give you a chance to get even - my luck is liable to run out. The item "Bill Ward Original Conti Crayon Art" is in sale since Sunday, July 24, 2016. This item is in the category "Collectibles\Comics\Original Comic Art\Drawings, Sketches". The seller is "plkstoys" and is located in Pond Eddy, New York. This item can be shipped to United States.